holding his drawing of the solar system. Newton was the second Lucasian Professor, holding the position founded by Henry Lucas, Cambridge’s Member of Parliament. Newton clung to the job for 33 years despite his obnoxious manners and his heretical ideas about religion. He succeeded by hiding his personal convictions and by being relatively reclusive. Not so his successor, William Whiston, who was fired after nine years. Born December 9, 1667, today is Whiston’s birth anniversary. I met William Whiston’s shadow while researching ideas about the Earth’s geological evolution. I read a bit of his 1696 book, A New Theory of the Earth: From its Origin to the Consummation of all Things wherein The Creation of the World in Six Days, The Universal Deluge, and the General Conflagration, as laid down in the Holy Scriptures, are shown to be perfectly Agreeable to Reason and Philosophy. The title alone almost stopped me before I started, but I’m glad I spent a couple of dreary days with A New Theory of the Earth. By the year 1700, some of England’s scientists were slipping away from the Church of England’s grasp. Deism (belief in an idle creator-god who plays no role in daily life) was ascending. Some contemporary scientists (notably astronomer Edmond Halley) were atheists. Others were mentally experimenting with variants of Christianity. Both Newton and Whiston fall into the latter group as they and many others tried to reconcile rapidly advancing science with rapidly fading faith. William Whiston was a polymath, excelling at language, maths, and physics. He was also a wildly popular author. He produced an extraordinarily appealing translation of Josephus’s History of the Jews – after the Bible, Whiston’s version of Josephus was the most widely-owned book in England – his translation of the works of Josephus was second only to the King James Bible in sales in the 1700s. A New Theory of the Earth was also a huge commercial success. His book, with its nod to a world designed by God, then set in motion and allowed to run on fixed laws, was well received by Isaac Newton, John Locke, and other notable contemporaries. 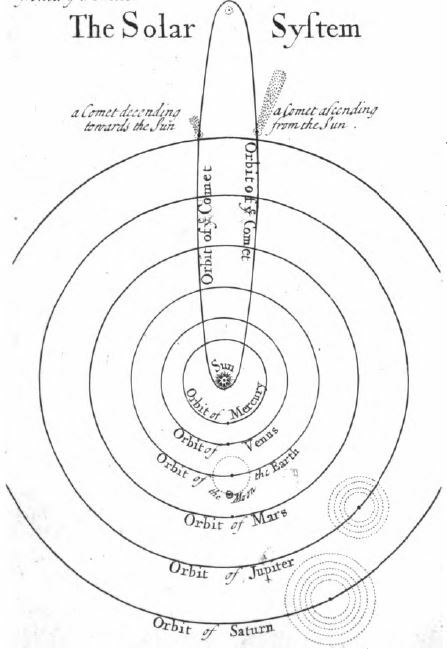 Whiston’s 1696 drawing of the solar system – almost good enough to use today. It was Whiston’s mission to reconcile science and scripture. This included the universe’s creation and its ultimate demise. For Noah’s Flood, Whiston had the necessary water delivered on the tail of a comet – on the evening of November 28, 2349 BC. Whiston correctly identified that comets contain water and his 1696 drawing of a comet’s orbit is among the earliest printed diagrams showing the Earth revolving around the Sun. Except for perfect circles, rather than ellipses for the planets’ paths, his sketch of the solar system could almost sneak into a modern Kansas high school textbook. Among his theories that were intended to unite science and scripture, Whiston preached that the Earth was motionless until the Fall of Man, after which it began to spin on its axis. 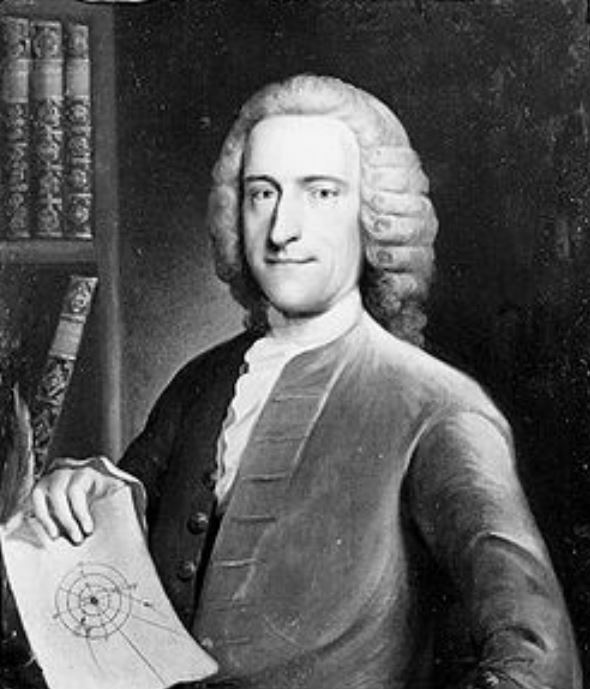 He had other interesting ways of bending science to show there are answers in Genesis – much as many accomodationists do today..
Whiston also maintained that the Earth originated from the atmosphere of a comet and most changes in Earth’s geological history could be attributed to the action of comets. God created the Earth out of the atmosphere of a comet, and then engulfed it in a Great Flood with the tail of another. Comets enamoured Whiston so much that he caused a bit of a panic in London when he predicted that one of those comets would collide with the Earth on October 16, 1736, and bring an end to life on the planet. It didn’t. William Whiston was an English priest and a distinguished mathematician. His popularity and an endorsement from Newton helped Whiston land his job as the Cambridge math professor (and third Lucasian professor). Although he was extremely religious and spent years working out scientific explanations for biblical stories, he ran into trouble when he reduced Jesus to the status of a lesser god in the Trinity. His heresy was his embrace of Arianism. Arius, a third-century Christian priest in Alexandria, Egypt, promoted the idea that God is the distinct and superior father of Jesus. Arius found the theory of the Trinity incomprehensible. In place of three gods who are one god, he offered a single deity. In the ensuing political battle, the philosophy of Arius fell from favour. Soon advocates of Arianism were deemed heretics. In 18th century England, Whiston didn’t have to fear a fiery death by religious purists, but his unyielding and outspoken adherence to Arianism eventually contributed to his loss of the Lucasian professorship. Whiston, unlike Newton who concealed his unorthodox beliefs, was a popular preacher. His vision of the universe saw Jesus as something of a messenger of the god who had created everything and had nudged it all into action. If Jesus had the message and God was letting natural scientific laws drive divine destiny, there was little need for the Church and its thousands of priests. Perhaps Whiston never said exactly those words, but the implication of his message was clear. Despite his considerable efforts, Whiston’s contributions to geology were slim. Today he is better known by students of religion than students of earth science. However, Whiston had suggested a geological history that lasted much longer than six thousand years, and he agreed that all geological changes were due to natural processes. On the other hand, many of the theories he created to bridge religion and scripture were so ridiculous that even today they serve as reminders of the futility of such an effort. This entry was posted in Biography, Culture, History, Religion and tagged Newton, Noah, Whiston. Bookmark the permalink.